Happy Gilmore. Brillstein-Grey Entertainment 1996. The main thing I can think of to describe my impression of this movie is… normal. Adam Sandler in the 90s playing a hockey player turned golfer sounds pretty normal next to Adam Sandler as a failure of a demon or Adam Sandler as a rich manchild going through elementary school, or even, to go later, Adam Sandler as an Israeli superspy turned fabulous hairdresser. I think he might actually be a fairly normal human being in this movie. I know he’s more serious now, but he did complete oddball roles back when he was “you know, that weirdo from SNL”. I seem to recall the reason he gets into golf is the idea of hockey players having good golf drives, which reminds me of Jamaican sprinters being good bobsledders. I wonder if there are many other movies built on sports having overlapping skillsets. When I was young, I got his powerful drive confused with the kid with the superhumanly tensioned arm from Rookie of the Year. Working stiff Happy Gilmore has wanted to play pro hockey ever since his superfan father taught him how to play. While he has an excellent slap shot, he’s not as good at ice skating or not attacking the coaches when passed over for another year. 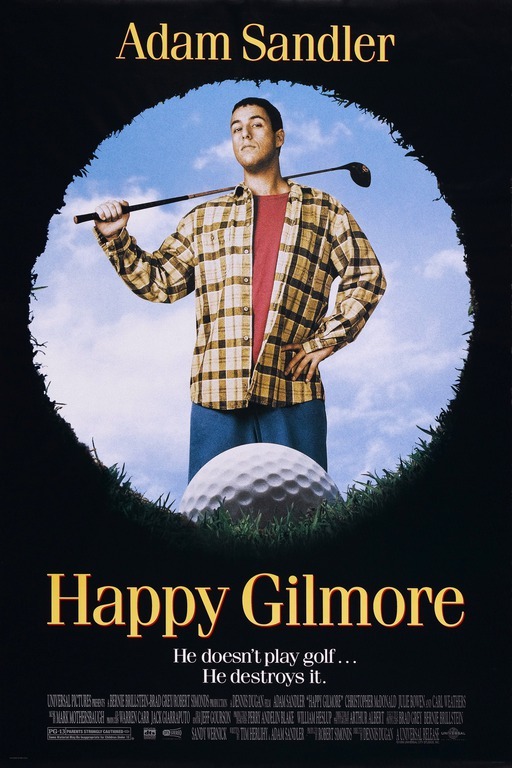 When his grandmother’s house is repossessed by the IRS to pay off ten years’ back taxes (which amount to an awful lot for a retiree who couldn’t afford to pay taxes), the moving men inadvertently help him discover that he’s got an amazing golf drive thanks to his slap shot skills, and former pro Chubbs encourages him to try professional golf, which Happy accepts when he learns there’s enough money in it to buy back his grandmother’s house. But if he’s going to make it in the PGA, he’ll have to do better than championship-hungry Shooter McGavin, as well as learn to control his hockey aggression and putt accurately. This really is one of Sandler’s most normal comedies. He’s just a wisecracking failed hockey player with family on the line. And according to his production company name (Happy Madison), he holds this one as his best alongside the one where he’s haunted by an imaginary penguin and he pees his pants to make it look cool to a bunch of grade schoolers. Meanwhile, while I’ve seen Christopher McDonald in a lot of things, usually as the bad guy, I’m not sure I’ve seen him playing this petty. He buys a house and pays a heckler just to irk an annoying competitor. And what’s his complaint about the guy? Happy stands a good chance of besting him, and he doesn’t fit in with the other golfers. I think the reason I associated Happy’s power drive with Rookie of the Year‘s superpitch is mainly in the jet engine sound effect used for the golf ball in flight. It emphasizes the speed of the ball, but I got the idea it meant it was superhuman, rather than just surprisingly good. The kid in the MLB had his broken arm heal in such a way that his arm was a coiled spring, Happy just learned a really good move in one game that turns out to be a fantastic move in another. His anger issues probably also contributed too. While it has no need to be, the music in this movie is excellent. Many scenes and montages are accompanied with songs I love from the 50s or 60s through the 90s. There may be a few I’m ambivalent toward (Endless Love), but mostly just greats like Wooly Bully, Money, Magic, Carry On Wayward Son, and Jump Around. Okay, I admit Jump Around is really more nostalgia than good, and I mainly know “Wayward Son” from Guitar Hero, but that doesn’t mean I don’t think it’s a good song. Watch this movie: as a look at what golf could be like if it were fun to watch. Don’t watch this movie: for outrageous antics and cheap shock humor.